It is amazing how life can give you blessings when you least expect them. When my parents were here for their annual visit we went to The Restaurant At Waterkloof Wines as they had really enjoyed their previous visit. This was the 14th of June and the restaurant was closing for their annual break after lunch service on the 15th. I had mentioned to Greg how much I loved Jerusalem Artichokes and after our meal a bag of them arrived at our table. Greg said that he would not be using them before they closed, and that the fresh produce would go to waste so he was gifting me the Jerusalem artichokes. I was so grateful, and my gratitude was extended to a crate of produce that came home with me. One of the wonderful items were 2 trays of quails eggs. I wanted to use them all up in a way that could be enjoyed for some time and so I decided to make Pickled Quails Eggs. Before we could do this we had to test how long it took to make an egg that was hard on the outside, soft on the inside and easy to peel. Once that had been perfected I tried a batch using a Jamie Oliver recipe. Once that batch was devoured, I made my own pickling liquid, using flavours I like. 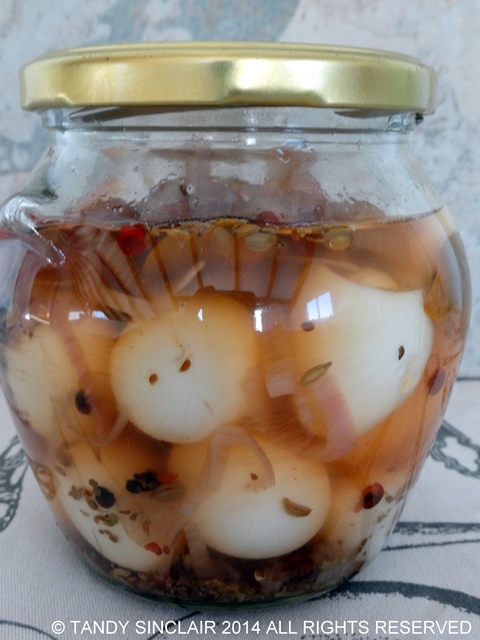 These pickled quails eggs take a little bit of effort but the taste is so worth it. I sat in front of the TV and peeled the lot – this being the most time consuming aspect of the process. What a lovely treat you were gifted. I like your pickling spice mixture…the eggs must have been great. Great idea Tandy. We have herds of quail running through our yard but alas, I find their eggs hidden in planter pots everywhere. Guess I’ll have to go to the Chinese market. I’ve never had a pickled egg but I bet I’d start with these! i really craving for it now Tandy! These sound and look amazing, Tandy! What a blessing! Loved this post! What a sophisticated recipe Tandy, silly question, just wondering when you say they taste like hen eggs you mean regular eggs right? I think I need to go to that restaurant and rave about something, too! Oh, Tandy, what a lovely thing for your friend to have done! A wonderful blessing! I love what you did with the quails eggs, too. So adventurous! I was quite tempted to do the same as a reward! Oooh, the kids and I love quail eggs 🙂 Thanks for sharing! Pickled eggs are definitely something I need to try! so exotic! I’ve only had quail’s eggs at a faaaannncccy restaurant but these look amazing. The pickled quail eggs sound so interesting. Quail eggs always look so sweet, but I’ve never tried one. Tandy, I learn every time I read your blog. Quail eggs??!? Pickled quail eggs! wow!! I have never heard of anyone even having access to quail eggs in my area so I will just have to take your word for it. I’m just wondering how big they are in comparison to chicken eggs? And do they taste the same? If you didn’t pickle them, I mean, could you just scramble them? Maybe this sounds ridiculous to you, but I wouldn’t know. I love quail eggs. This looks like a great way to extend their shelf life. Greg is such a nice man, how generous of him. The pickled eggs look wonderful! Quails eggs are so cute and these look fabulous Tandy – one of the vendors at our Farmers’ Markets have a good supply, so might just get some this weekend and give this a try.